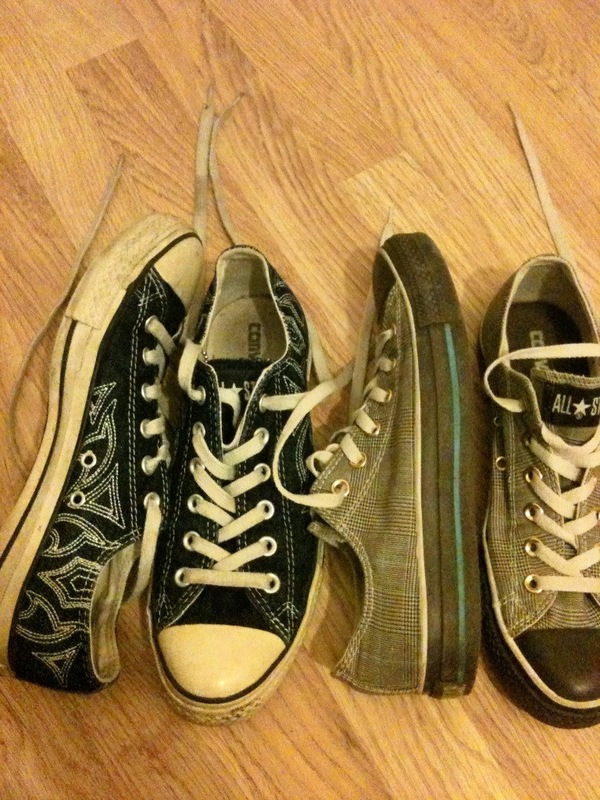 I took these photos ages ago, because someone expressed interest in my shoe collection. Now, I have to preface this with the statement that most, if not all, of these Cons were bought because my husband is a sneaker freak. I find them a little narrow for my big duck feet, and my pinkie toe always is unhappy. But! I have some gorgeous, limited edition sneaks because of my husband’s sneaker fetish. It’s great to go shopping with him – he does all the work, knows all the necessary heritage of a kick, and as I’m a size 7/8 (men’s, or European size), most of the time the only good ones left are my size instead of his (11). 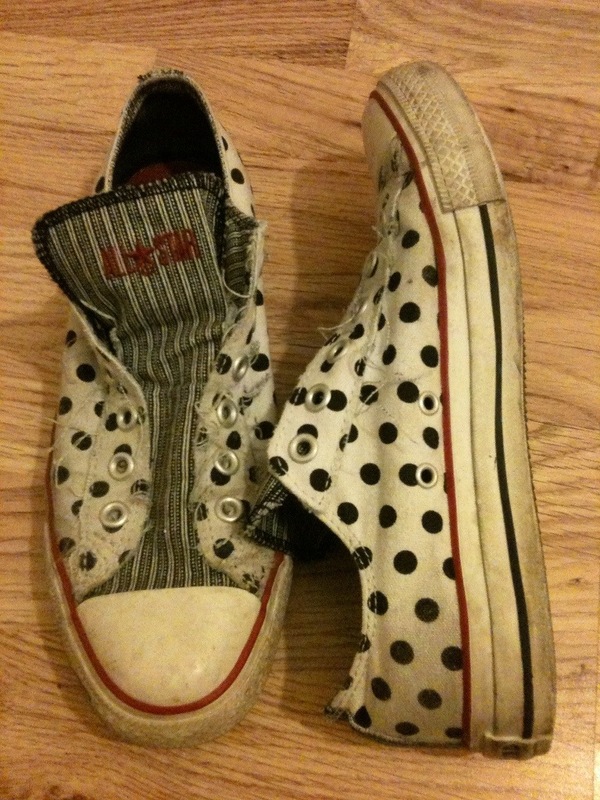 My oldest, rattiest pair, bought for about $9 in… Maybe 1998? 1999? I still wear them. 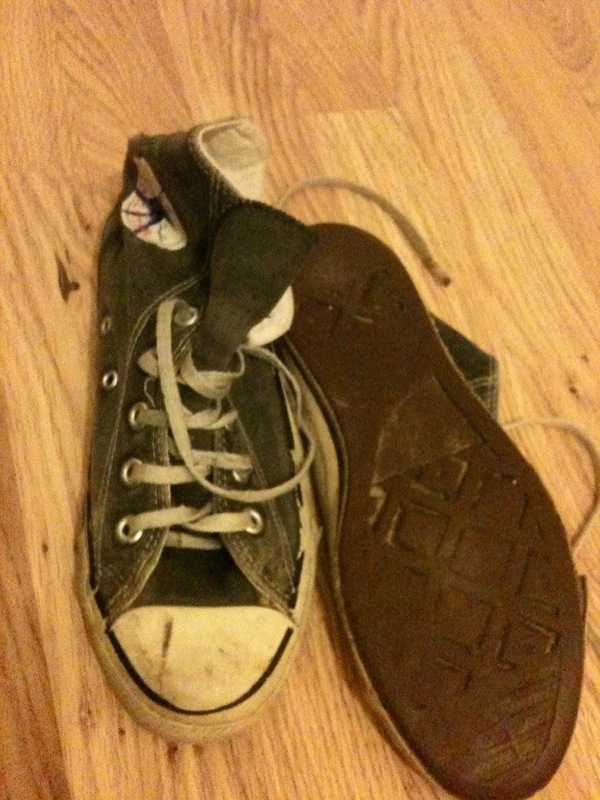 Soles are nearly worn down, and they have been put in the washer once – they useta be black. 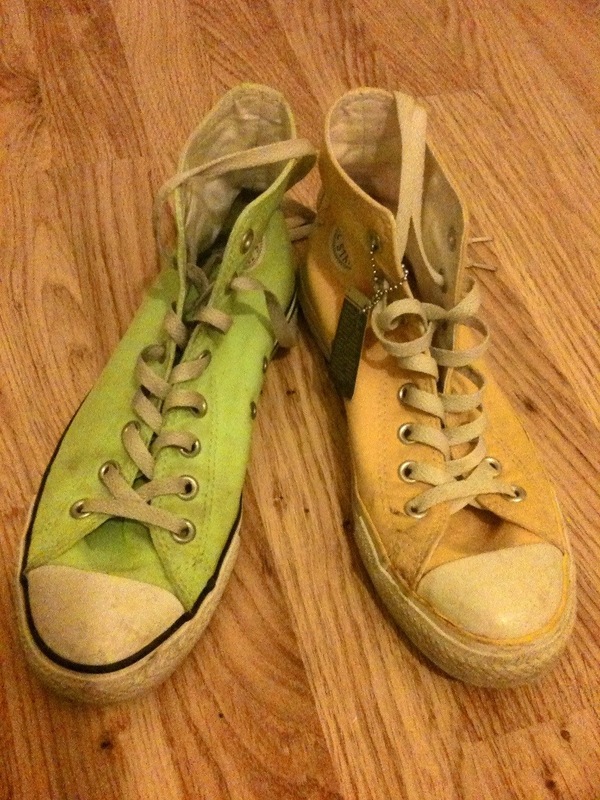 Pretty sure these are my next oldest purchases – found cheap in an odd shop in southern/middle Ohio in about 2005. Yes, I wear them like this! Unless it is Paddy’s day, in which case I go full green. 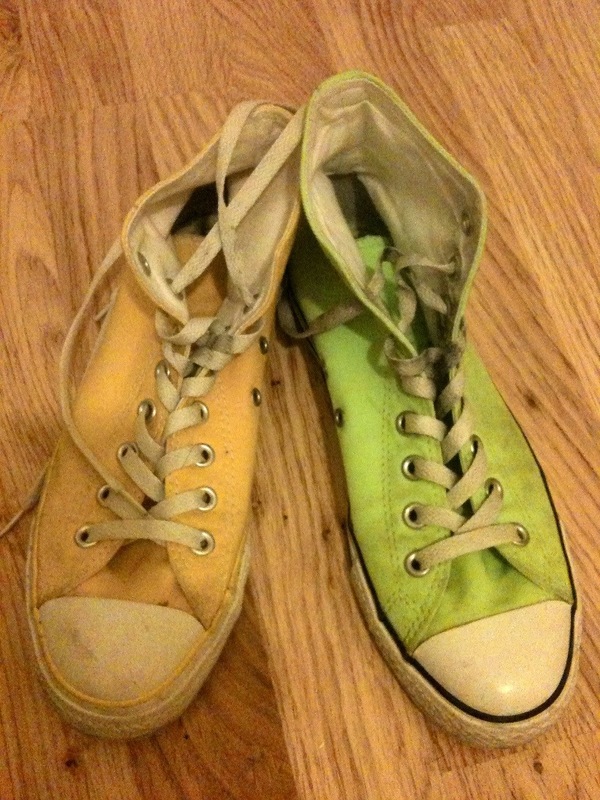 I really have no need, ever, for yellow shoes. I hate yellow clothing. The low-rise set. I like the ones on the left, as they match any pair of jeans. But! The ones on the right are apparently really rare and valuable. So says himself. They are an unusual plastic upper, so great when it is wet out – as it often is. But, honey? Should I wear these tonight? NO, it’s raining! Sigh…. Notice that the tag is still on? Yeah. He says that’s important. For fashion. Terrible pic. 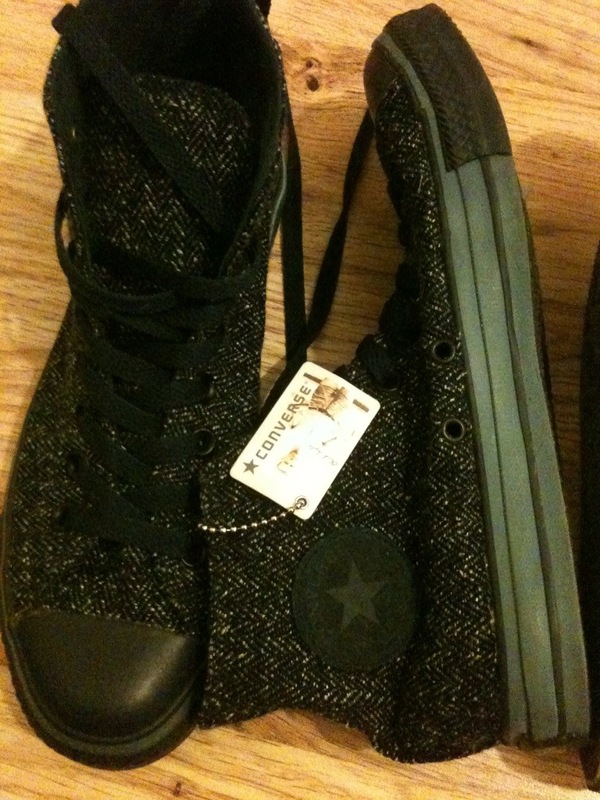 They are dark blue, and again, they match any jeans but I can’t be arsed lacing these bad boys up very often. 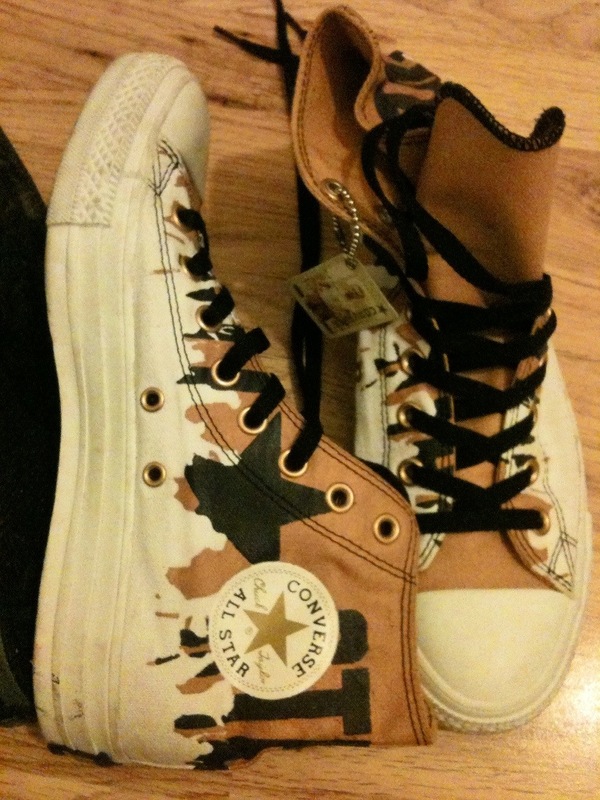 Possibly my favourite pair. I love the black laces against the white and gold. They look like tiger shoes! I don’t mind keeping these out of the rain – they are flippin’ white, after all. I also don’t mind so much when hubby has to make sure that the laces lie ‘just so’, as the laces are kind of important to the overall look of this shoe. I bet these are his least favourite! Not for the ‘honey help me’ factor, but because they are tacky as hell. Maybe sometime in the next 8 months I’ll get around to posting pics of my Nike collection. A lot less shoes, but way, way more awesome (according, of course, to Himself).